Bel Aire luxury estates San Jose are located in the Evergreen Valley foothills, directly across from Silver Creek Valley Country Club. There are just 172 home sites in this upscale neighborhood and homes are not often available to buy. 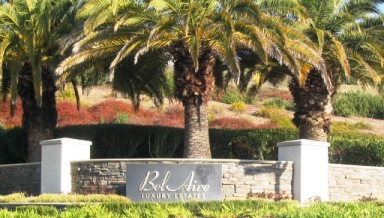 Built in 1998-2000, Bel Aire Estates is part of Silver Creek. The neighborhood is not gated and has beautiful views of the Evergreen foothills. Just minutes to downtown San Jose and major employers make this secluded and peaceful new neighborhood one to consider. Homes are located on half acre lots, provide four or five bedroom homes in classic home styles with square footage up to 5,300. A few homesites have up to 3 acres. For golfers the location of this neighborhood is close to several choices. Courses nearby include The Ranch at Silver Creek, Silver Creek Country Club, The Villages Country Club. Nearby Almaden Valley also has Almaden Valley Country Club, Santa Teresa Golf Club and Boulder Ridge Golf Club. Nearby the Joseph D Grant County Park offers nearly 10,000 acres of parkland where you can walk, hike or ride the horse trails. Located in Santa Clara County residents get a great view of Mount Hamilton. If nothing shows, sorry no homes available in Bel Aire San Jose. Ask me to add you to my email list for any homes that become available. This exclusive neighborhood is just 17 minutes to San Jose International Airport. For summer fun you’re only 5 miles to Raging Waters San Jose a 23 acre aquatic park. For shopping the New Seasons Market-Evergreen is right next door on Silver Creek Valley Rd. There are other schools and academies nearby including Valley Christian Schools. Connect with school offices to learn the boundaries for any home you are interested in. I’m ready to answer all your questions and go to work in finding you the perfect choice in Bel Aire Estates San Jose or Silver Creek Valley Country Club. Or if it is time to move, get a custom-designed marketing plan and let’s get it SOLD. Call me, 408-972-1822.